London is home to some of the most famous museums in the world; the National Gallery, the Science Museum, the British Museum and the Imperial War Museum to name just a few. But you might not know that you can hire all of them out for your event. The list below features 10 of the more unusual, bizarre and quirky London museums out there, which will make any event stand out from the crowd. Each of these venues has a distinct personality, perfect for giving an offbeat event idea that certain je ne sais quoi. Welcome to a museum with a license to thrill. The London Film Museum in Covent Garden is home to the UK’s most extensive collection of all things 007, including some of the sleek automobiles featured in the James Bond franchise’s many iterations. If Bond is not your thing, the museum also features a wide-range of memorabilia from other popular movie sagas such as Star Wars and Batman. There are also many exhibits that delve into the science behind the movie-making process itself. This venue is a special treat for movie lovers, and an especially exciting proposition for any would-be host looking for a Bond-themed event that’s more shaken than stirred. This exquisite Victorian landmark is the jewel in the crown of Kensington’s cultural landscape. Home to the eccentric English painter Lord Leighton throughout the 19th century, the Leighton House Museum is an extravagant and intricately-decorated Grade II-listed masterpiece. The museum’s architecture and artwork fuse the best of English, Renaissance and Arabic traditions into a dazzling whole. The home preserves the spirit of the inimitable Lord Leighton, and is a testament to his elegant curatorial sense and the English love of collecting. This venue is perfect for any wedding reception, product launch or summer soirée that requires a touch of historical refinement and oriental glamour. Check in with your favourite products at the Museum of Brands, Packaging & Advertising in Notting Hill. This survey of British consumer culture is structured as a ‘time tunnel’ of sorts that charts the rise and fall of our most beloved brands and products from today and yesteryear. A guaranteed nostalgia fest, your guests will have the joy of rediscovering the cherished products from their past. The Museum of Brands, Packaging & Advertising is an intriguing look into the stories behind today’s powerhouse brands. It is a fitting venue for product launches, and would be an inspired venue choice for an advertising industry function. The wide variety of designs and trends on displays are certain to spur the mind of any budding Don Draper or Peggy Olson into action. Tune in and pig out at the Hard Rock Café, but don’t forget to visit the Hard Rock’s Vault Museum. A short walk from Green Park station, this shrine to the Gods of Rock has something to offer all musical tastes. Exhibits include the guitar that Slash shreds in the ‘November Rain’ Guns n’ Roses video, and other assorted memorabilia from music legends like The Beatles and Madonna. The perfect appetiser to an eat-a-thon at the accompanying restaurant, the Vault at the Hard Rock Café serves up a slice of inspiring musical nostalgia that will have you singing into your cutlery afterwards. Delve deep into the mind of one of history’s most influential thinkers with a visit to this cultural gem in Hampstead. The museum preserves the living arrangements of the legendary psychoanalyst Sigmund Freud during the last years of his life spent in exile from Austria on account of the Nazi occupation. The residence contains an astonishing array of classic texts and precious antiquities amassed by Freud throughout his lifetime. The museum also frequently features exhibitions by internationally-renowned artists. Artworks are often staged alongside Freud's possessions, such as the (in)famous couch used during his therapy sessions. The Freud Museum is an unconventional treasure steeped in history. If you’re looking to stage a networking or dating event with an ironic twist, why not choose the home of psychoanalysis itself and let the subconscious manipulation commence? The Museum of Childhood hosts collections that aim to explore the history of the material culture and experiences of childhood. The building itself was utilises left over prefab structures from Prince Albert's developments of Exhibition Road in South Kensington. Opened in 1874 the museum has become an iconic part of Bethnal Green. 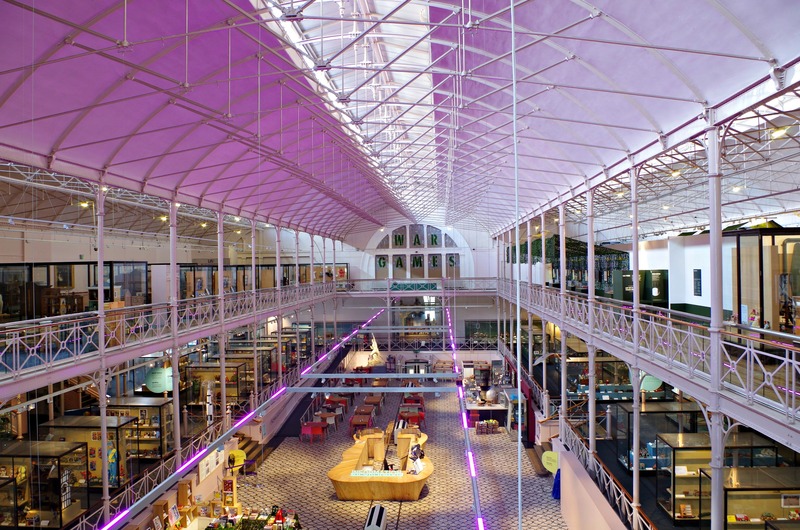 Events hosted in the main hall enjoy the vast ceiling and the balconies which line the hall. The museum's collection is a nostalgic treasure trove, bringing together almost 150 years of childhood memories. There are few who won't be charmed by this incredible venue. The Museum's genesis in the philanthropic endeavours of the Victorian era make it an ideal space for charity and gala dinners. The MCC Museum at Lord’s Cricket Ground is a genuine treat for sport lovers. One of the world’s oldest sporting museums, the MCC features a wide variety of exhibits showcasing the storied history of the world’s most sophisticated sport. Items include the kits of many former cricket greats, such as Shane Warne and Don Bradman. It is also home to the most exalted object in all of cricket lore, the Ashes Trophy. The MCC Museum is a guaranteed conversation starter for business functions, as you and your guests relive the most significant moments of cricket history. Make connections and network in style at the London Transport Museum. The museum is a comprehensive showcase of the eclectic variety of transport options used by Londoners through the ages. This expansive space is the ideal location to give your awards show, gala or other function that distinctive ‘Made-in-London’ feel. The venue is situated in the heart of London’s glamorous Covent Garden, in a perfect situation next to the bustling marketplace. A winner for kids and adults alike, this London treasure is certain to have automobile and train buffs captivated. Armourers’ Hall, established in 1346, is a veritable London institution. Packed with 16th-century armour, lavish paintings and an arsenal of peculiar weaponry, the Hall is a fitting location for a banquet with a difference. This establishment has an astounding reputation for survival in the face of adversity, having withstood both the Great Fire of 1666 and the WWII Blitz. 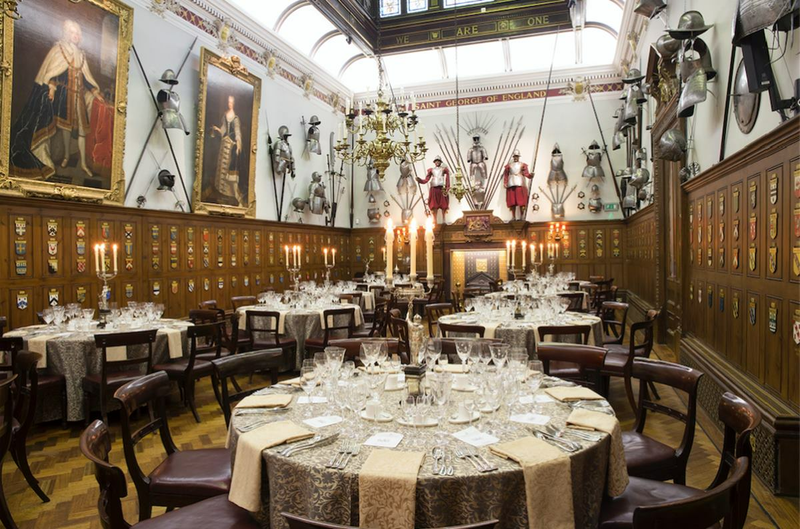 Armourers’ Hall is the perfect setting for a rousing company dinner, a place to celebrate commercial triumphs and the tenacity of the English business spirit. Take a journey through the historical imagination of one of London’s most unorthodox artistic personalities at the Dennis Severs’ Museum in Spitalfields. The house is celebrated by critics as a one-of-a-kind “still-life drama” that recreates the living arrangements of a stereotypical London family throughout Victorian London. This structure makes the overall experience of navigating the museum akin to a form of time travelling through the history of London’s citizenry. The experience of walking through the museum immerses you in both the aspirations and realities of past generations. Dennis Severs’ house is a bizarre cultural landmark that defies categorisation, perfect for any event that requires something utterly extraordinary and unexpected.